A touring retrospective exhibit of stage designer Cameron Porteous’ remarkable contribution to theatre in Canada. Curated & designed by Sean Breaugh and Pat Flood. 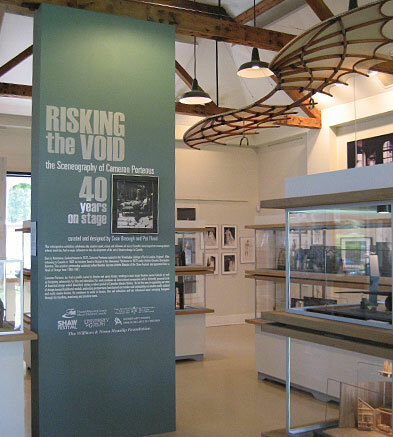 Theatre Museum Canada now has a year-round display space thanks to the Macdonald Heaslip Walkway of Theatre History. This is a wonderful opportunity for us to mount temporary exhibits celebrating and exploring Canada’s performing arts heritage. Divas of Design celebrated the work and creative process of three leading ladies of operatic design: Dora Rust-D’Eye, Dany Lyne and Susan Benson. In recognition of the 30th anniversary of the Berkeley Street Theatre, Theatre Museum Canada and Canadian Stage mounted a special exhibition in the lobby of the theatre with programs, posters and reviews going back to the days of Toronto Free Theatre. Celebrating the 90th birthday of Theatre Museum Canada’s founder Herbert Whittaker, this show featured his personal collection of photographs, set and costume designs, props and other memorabilia. The theatrical treasures were collected by Mr. The Theatre Museum’s inaugural exhibition featured numerous set designs, maquettes, posters by Theo Dimson, video clips, and other memorabilia from such ground-breaking shows as Hey Rube, The Mac-Paps, Christopher Columbus and Ten Lost Years.